The contributions of women to our society cannot be overstated, even if those individuals have not received the credit they were due in most historical accounts. Before our modern era, the common perception of women had more to do with their roles as mothers and homemakers rather than as scientists. But that is an incorrect and unfair characterization. Although female scientists were often denied recognition for their accomplishments, they were responsible for many groundbreaking discoveries and advancements in science. They still are today. Yes, that’s right. The structure of DNA was discovered by a woman. Three men won the 1962 Nobel Prize in Physiology or Medicine for bringing us what we now know as the double helix, the molecular shape of DNA. But the discovery was actually made by a woman named Rosalind Franklin who worked in conjunction with the men. She was overshadowed by her peers when they accepted the award. However, she made incredible contributions to this discovery even though she was left out of the spotlight. She managed to take a photo of DNA up close. It resembled an “X” on the film once it was developed. The photo was later called “Photograph 51,” and a play about Franklin was produced with that same title. This catapulted our understanding of ourselves and the innermost workings of the body, which has helped physics, biology, and chemistry progress exponentially since then. Earth is composed of several layers. Although there are different ways to categorize these layers, we’re going to divide them into the crust, the mantle, the outer core, and the inner core, which was discovered by Danish seismologist Inge Lehmann in 1936. The outer core is a molten one, while the inner core of the Earth is completely solid. The discovery of the inner core has helped us to determine the age of the Earth as well as plenty of other things. By measuring the cooling rate of the Earth’s inner core, we’ve discovered that the inner core is likely to have begun solidifying about 0.5–2 billion years ago. Nonetheless, the growth of Earth’s inner core is believed to play a vital role in generating Earth’s magnetic fields. Physics Professor Heidi Jo Newberg at the Rensselaer Polytechnic Institute is well-known for her contributions to our knowledge of the structure of the Milky Way galaxy. The Milky Way is a barred spiral galaxy that contains our solar system. It spans at least an impressive 100,000 light-years. Newberg and her team found that the Milky Way cannibalizes stars from galaxies that are smaller. Also, they determined that the Milky Way is bigger than previously believed and has more ripples. In 2002, Newberg’s research discovered that the disk of the Milky Way was corrugated. This led to a revised estimate of the width of the galaxy from 100,000 light-years to approximately 150,000 light-years. However, scientists are still debating this measurement. As happened all too often back in the day, a woman named Lise Meitner, one of the duo who discovered nuclear fission, was overlooked in 1945 when the Nobel Prize in Chemistry was awarded to her partner, Otto Hahn. He accepted it by himself for work the two had done together. This wasn’t the first time in her life that this happened. She’d discovered radiationless transition in 1923. However, her discovery was overlooked and credited to Pierre Victor Auger, a man who found the same thing two years later. In fact, the phenomenon is named the “Auger effect” after him. Meitner came up with the term “fission” as early as 1939 and explained the process in a paper she’d published with the aid of her nephew, Otto Frisch. Nuclear fission was a process that would later become instrumental in the creation of the atomic bomb. Gabrielle-Emilie Le Tonnelier de Breteuil, marquise du Chatelet, was an 18th-century philosopher, mathematician, and physicist. She gave us the first-known description of kinetic energy as well as the first translation into French of Sir Isaac Newton’s famous work Mathematical Principles of Natural Philosophy. It remains the standard translation to this day. Kinetic energy is the energy possessed by a particle or object because of its motion. Previously, it had been believed by Newton, Voltaire, and others that kinetic energy was proportional to a moving object’s velocity. Du Chatelet corrected their formula. For one thing, she added that kinetic energy is also dependent upon an object’s mass. Overall, she released four scientific works and five other works, solidifying her place in history in the fields of mathematics and physics. Marie Curie, a French scientist who was born in Poland, discovered much of what we know today about radiation. She studied radiation in depth, including uranium and thorium, finding both to be radioactive materials. She also came up with a way to measure the total amount of radiation. Her major claim to fame, however, was the bold (at the time) assertion that radioactivity didn’t depend on an element’s form but on its atomic structure. She was the first person to use the term “radioactivity” and invented a new field of scientific study called atomic physics. Marie Curie won the Nobel Prize twice–for physics in 1903 and chemistry in 1911. The day was November 28, 1967. Two astronomers, Jocelyn Bell Burnell and Anthony Hewish, were about to make an amazing discovery—the pulsar—a rapidly rotating neutron star which shoots out a beam of electromagnetic radiation as it spins. The chances were slim that they’d stumble upon one as the beam from a pulsar needs to be aimed directly toward Earth to be detected. They just happened to be looking at the sky on a clear evening when they made the discovery. Jokingly, Burnell and Hewish called the electromagnetic pulses “Little Green Men,” suggesting that aliens might be trying to communicate with us through a beam. But it turned out to be a perfectly natural phenomenon in some stars. 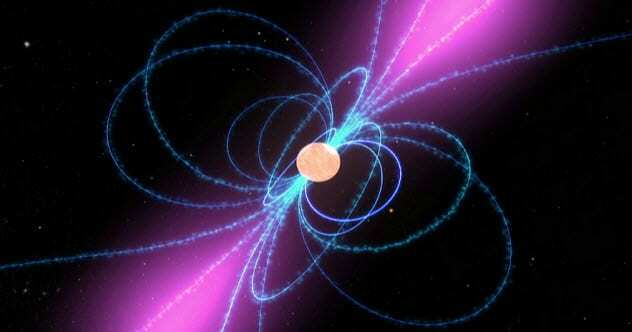 The distinct pulses of radiation emitted from pulsars appear at regular intervals. The “pulsing” nature of the beam is due to the star spinning and the light repeatedly striking the observer’s line of sight. In physics, top quarks are the heaviest of all the elementary particles. This was confirmed by the Large Hadron Collider in 2014. Quarks are tiny particles that make up neutrons and protons, which are two of the three components of atoms. The third component is an electron, also known as a fundamental particle because it cannot be broken down any further. Atoms are the building blocks of matter within our universe. The six flavors (types) of quarks are up, down, strange, charm, bottom, and, of course, top. The top quark was discovered by Melissa Franklin and a team at Fermilab. This wasn’t the only time that Franklin made a grand discovery in the world of particle physics. She was also part of the team at CERN that discovered the long-anticipated Higgs boson. Did you know that the speed of light can slow down in some cases? It certainly can, which we know thanks to Danish physicist Lene Vestergaard Hau who discovered “slow light.” In a vacuum, light travels at 299,792 kilometers (186,282 mi) per second. However, when light travels through matter, it slows down. By injecting light into something called a Bose-Einstein condensate (a state of matter), Hau and her Harvard team were able to slow down the speed of light to a mere 27 kilometers per hour (17 mph). Even more astonishing, her team made light stop in a Bose-Einstein condensate. Hau will go down in history as the first person to ever actually stop light. Human immunodeficiency virus (HIV) has infected over 70 million people and killed over 35 million since its discovery in the 1980s. It is our modern-day version of the black plague in a very real way. Barre-Sinoussi’s team sought to find out what was causing AIDs. Suspecting that it might be a retrovirus, they found it when they dissected the lymph node of someone who’d contracted AIDS. Frighteningly, Barre-Sinoussi believes that a cure for HIV is next to impossible. This article was originally published by Listverse.com. Read the original article here.